【4 Different Flavours Wax Beans】Natural wax ingredients with chamomile, lavender, rose, Bamboo charcoal, original four different flavors. The wax firmly gripping each strand, gently removing it from the root,around 85% to 99% success rate without any side effects. leaving your skin soft and glowing and enjoy being hairless at least for 3 weeks. 【Quality Safe Material】Upgraded heat-resistant ABS material for WLWQ hot wax warmer that is nonflammable, hard and prevents wax warmer from overheat, melted and bubbled. 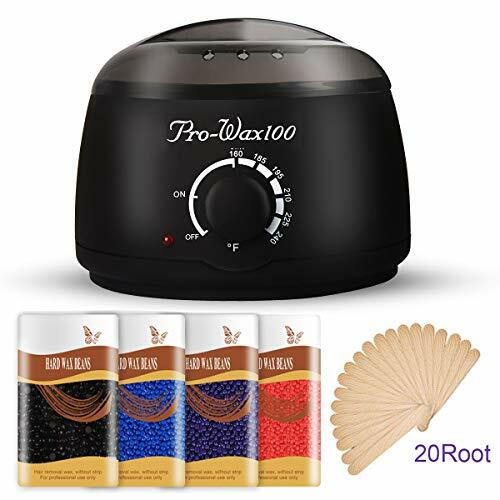 【Suitable for Most Wax Types】WLWQ wax warmer melting pot can melt most wax format including hard wax, soft wax, wax cans, loose wax, bricks bikini wax kits, microwavable wax kits or hair waxing kits. Great Machine! Works Great! pays For Itself! Nice quality product! Wax is very nice and easy to peel off. Machine is a very nice quality.